It is hard to summarize what Kahal Chasidim, Shearis Yaakov is about in words. Please, join us for davening and experience it for yourself! But, we will try to summarize some things about our shul and our Rabbi. The name “Kahal Chasidim” (Congregation of Chasidim) means that our shul is a place where the welcoming spirit of Chasidism is manifested and where all Jews are met with warmth and hospitality. Shearis Yaakov is in memory of, and L’iluy Nishmas Rabbi Sochet’s great grandfather, Reb Yaakov Halevi Sochet, a very special Jew. He was born in Torczyn Volynia (Poland) around the year 1890. In 1906 he emigrated to the USA. Reb Yaakov stood firm in his Yiddishkeit at a time when the odds were very much against successfully maintaining one’s Jewish tradition. Although his mettle was tested many times, he prevailed. In 1921 he came to Los Angeles where he worked as a shochet. His three sons (all born in Los Angeles) grew up to be ehrliche Jews who all raised families of G-d fearing children. He passed away in 1948 and is buried in Home of Peace cemetery on Whittier Blvd. in Los Angeles. He was a Chasidishe yid with all his heart and he lived to serve Hashem and to help other Yidden. May this shul be an Aliyah for his Neshama. It is a Synagogue dedicated to the finest traditions of the Chassidic movement. 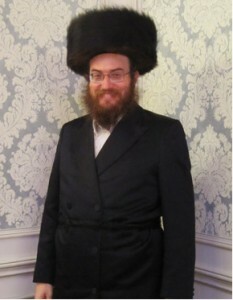 Rabbi Dovid Yeshoshua Sochet, spiritual leader of Kahal Chassidim Shearis Yaakov, is the son of the Karlin-Stoliner Rebbe who lives in Givat Ze’ev and a certified Mohel. Rebbetzin Sochet is descended from the Nadvorna dynasty. They are both also descended from the Baal Shem Tov, the founder of the Chassidic movement. Rabbi Sochet is a certified mohel. He has performed many circumcisions. Rabbi Dovid Sochet is a pleasant, righteous, and a caring person, and a very skillful Mohel. Rabbi Sochet studied in Great Britain and the US, and we were happy to have him perform the Brit Milah ceremony of our Grandson. A few days prior, he visited the baby to check his bilirubin and kept visiting him daily to be sure that he was fine before the Bris. The night before he came with his wife and children to visit us and this gave us a feeling of him being a real family Rabbi. The Bris was done at his place and all our family, friends, doctors with a number of rabbis were present. The Rabbi remained calm and friendly in spite of the large number of people looking over his shoulder. The Bris procedure was flawless, and everyone was happy. My son, a doctor was also in attencance. The Mohel needed no assistance and everything went perfectly. I checked my grandson daily and the healing was great. It was a perfect Bris. I do not need to say anything more to recommend Rabbi Dovid Sochet as a Mohel. With the help of HaShem, may he have the blessings and continued success of this Mitzva for the continuation of the Jewish nation. My family and I highly recommend Rabbi Dovid Sochet the Mohel for the next Bris in your family. There are some people who provide a service and there are some people who do more. Choosing a Mohel for one’s son is an emotional event in the best of times but being that my son was to be the name sake of my recently departed father ratcheted up the feelings to a fever pitch. The care, sensitivity, and professionalism that Rabbi Sochet demonstrated was a balm to my frazzled nerves. His reputation had preceded him which is why I had flown him to NY from LA where he had been at the time. In retrospect it was money well spent. He is professional yet approachable, carefully explaining each step of the process, soothing any concerns new parents can feel at times. There are some people who provide a service and there are some who do more. Rabbi Sochet is one of those people. I strongly recommend him and his expertise. Rabbi D. Weiss Lakewood N.J.
To contact Rabbi Sochet to schedule a bris please call 845-659-4041. The word Bris means covenant; the word Milah, to circumcise. Hashem (G-d) commanded Avraham, Judaism’s founding father, to circumcise himself and all male children born to his offspring. Avraham was the first person in history to perform a Bris Milah, he even circumcised himself. Circumcision is the forging of a blood pact between Hashem and the Jewish people. Why on the 8th day? The Bris is performed on the eighth day after the baby is born since the Torah commands us to do so. Different reasons are given for the significance of the eight day. The Ohr HaChaim HaKadosh (R’ Chaim ben Atar 1696-1743) quotes our sages as stating that waiting eight days is a sign of HaShem’s mercy on the child, so that the baby would have the strength and energy to survive the procedure. The Ohr Hachaim then asks how our sages knew that the child gains the necessary strength specifically on the eighth day. The answer lies in the Zohar, which states that the child gains strength from passing through Shabbos night. 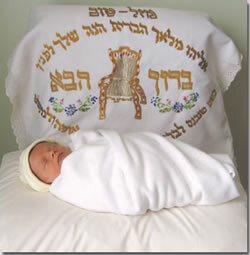 It is the Shabbos that establishes the newborn baby as one whose existence is stable. As our sages state, “the world was shaking and unstable throughout the six days of creation until the Shabbos came and made it strong, and then it rested.” Therefore, to insure that even a baby born on Shabbos day would pass through a Shabbos night before its bris, the Torah made bris mila on the eighth day. The kabbalistic writings teach us that the number eight alludes to the concept of eternal Jewish continuity. In the Torah, all references to the numbers have great significance. Seven days represent the physical world of creation, the eight day transcends everything physical. Thus, when a child has lived for eight days, he has transcended the physical to the metaphysical. The Bris Milah, performed on the eighth day, reminds us that Jewish survival is not merely a natural phenomenon, but rather it is a supernatural one. Jewish survival defies the laws of nature. The Bris ceremony has two parts: the actual circumcision and the naming. It is customary to honor family and friends to participate in holding the baby at various parts of the bris. The highest honor is to be the sandak, who holds the baby during the actual circumcision. The naming of the child is the most emotional part of many bris ceremonies. The naming of a Jewish child is a most profound spiritual moment. The Talmud tells us that parents receive one-sixtieth of prophecy when picking a name. An angel comes to the parents and whispers the Jewish name that the new baby will embody. Further, the Sages say that naming a baby is a statement of his/her character and his/her path in life; for at the beginning of life we give a name, and at the end of life a “good name” is all we take with us (see Talmud – Berachos 7B; Arizal – Sha’ar HaGilgulim 24b). Jews of Ashkenazic-European decent have the custom of naming after the deceased. The immortalizing of a close relative or friend is a beautiful tradition. Sephardic Jews have the tradition to name after the living. A child may have one or more names, in accordance with the parents’ desires. It is traditional to have challah (bread) at the bris, but it is not necessary. However, wine is required as it is part of the ceremony. These are the supplies needed for the Bris Milah ceremony. A box of 3×3 gauze pads. A large fresh tube of plain, non-creamy, non-scented Vaseline or Bacitracin. An unopened bottle of Sweet Kosher Concord Grape Wine and a Kiddish cup (NOT Blackberry or Cherry) (room temperature). A bottle of Infant Tylenol Concentrated Drops (Generic is fine). Dose is 0.4ml every 4 hours starting after Bris if the baby is fussy. A small table for mohels instruments. Do not feed the baby one hour prior to the Bris. Baby should be wearing a “onesie” underneath whatever clothing you select for him to wear. When the bris is complete, his mother may take the baby to a quiet room and feed him. After that, Rabbi Sochet likes to do his first diaper change with the parents, to check him for bleeding and to show them how to care for the circumcision by applying Vaseline petroleum jelly with each diaper change for four days. Rabbi Sochet is available to you 24 hours a day, if you have any questions or difficulties caring for the circumcision. Please check your son for bleeding within 1/2 hour of the circumcision. Call me if there is ongoing bleeding from the wound. If he seems fussy or uncomfortable after the bris, you may give him Infant Tylenol/Acetaminophen Infant Liquid, 1.25ml every 4 hours as needed for pain relief. The bandage wrapped around his wound at the time of the circumcision should not be removed. Rabbi Sochet will return the day after the Bris to remove it. As your son urinates during the first 24 hours, some of the coagulated blood in the bandage may dissolve and you might see a pink or red stain on the diaper or gauze pad. This is not an indication of significant bleeding, and you should not be concerned. After the first 24 hours, you will see several things. The crown will be red or purple. It is neither infected nor bleeding. It is red because until now it has not come into contact with light or air. This redness will disappear soon. You may also see swelling beneath the glands (the crown is not swollen; only the tissue beneath it is). This is normal. The swelling will go down within a few days. You might also see a mucous discharge. This is lymphatic secretion which might vary in color from white, yellow, green, or gray. It might be noticed on the head or shaft and will resemble a soft scab or a film. In some cases, the build-up of this secretion might look like pus or a blister, but it is neither. Do not attempt to remove it, since doing so might cause bleeding or discomfort. Just leave it alone and it will go away. Each time you change your son’s diaper, use the tubes of Vaseline and squirt a large amount of Vaseline onto a gauze pad. The more Vaseline you use, the better. Gently place the gauze, Vaseline facing down, on the wound site. It helps the circumcision to heal, and keeps it from sticking to the diaper. Do this with every diaper change for a week, or until it looks completely healed.